Professional Biography: Tracie attended Oklahoma State University (Go Pokes! ), earning a Bachelor of Business Administration in Management degree. She also earned minors in Personnel Management and Marketing. Tracie graduated from OSU in 1985. Tracie began her career working in retail management for Dillard's in San Antonio, Texas. After moving back to Oklahoma, Tracie worked for Foley's in Oklahoma City. In 2001, Tracie moved to Cushing and worked for 9 years as Children's Director at the First United Methodist Church and added the duties of Finance Secretary there as well. Tracie began work for CBEW Professional Group as a staff accountant in May of 2012. 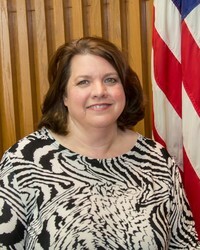 Then on December 31, 2012, she started working for the City of Cushing in her current position as City Treasurer and Human Resource Manager. Personal: Tracie Rose was born and raised in Stillwater, Oklahoma. She married Glen Rose in 1990 and they are the proud parents of two daughters.